Learn about Seabeck here, and when you are ready, Register here! As always, housing is based on a first-come basis, so don’t delay! Registrations are time- and date-stamped. Before you register, please check out housing options here. Be prepared with two to three housing choices. We are thrilled to confirm that the featured speaker for Seabeck 2019 is once again, Guy Nelson, a well-known entity in the Seattle area as a long-time radio host on KUOW-NPR. Guy Nelson is back by popular demand for “Round Two” at Seabeck after an amazing, deep and fun community-building experience at Seabeck 2018. 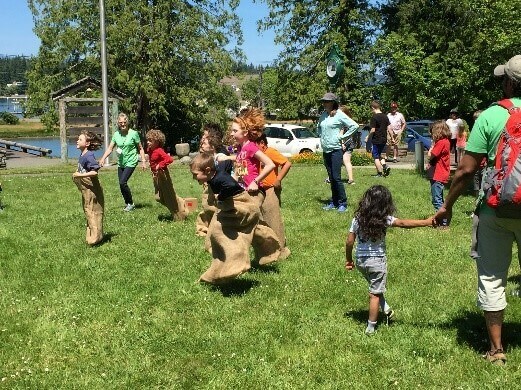 At “Seabeck 2019: A Moving Experience”, our theme will be Movement and Guy will lead us in plenty of fun and imaginative games that explore the many ways we move our bodies. Participation – mind, body and spirit – is as you are willing and able, as always. The 2019 Organizing Team is already busy planning the schedules of workshops, music, children’s programming, and fun activities. As usual, a flexible schedule will allow you to “build your own Seabeck experience.” Offerings will include activities for all ages and temperaments plus plenty of free time to catch up with friends, rock on the porch, or find a sunny spot on the grass. Feel free to contact Beth Wilson, ESUC Co-Dean or Jennifer Joslyn Sill, UUC Co-Dean with any registration or programming questions, or Dianne Upton or if you have a problem signing in.